The 7th Annual Journey to Wellness 5K Run/Walk is a free fun Run/Walk for the entire community! 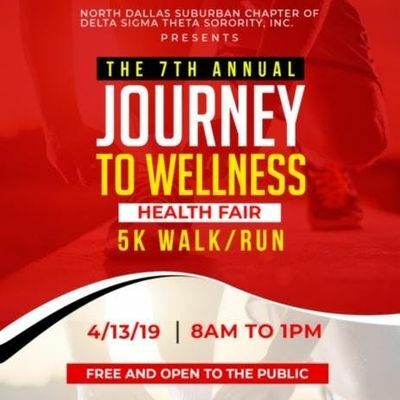 In conjunction with our Journey to Wellness Health Fair, The North Dallas Suburban Chapter of Delta Sigma Theta Sorority, Inc. is encouraging participants of all ages to get off the couch, put down the remote, and get MOVEing. 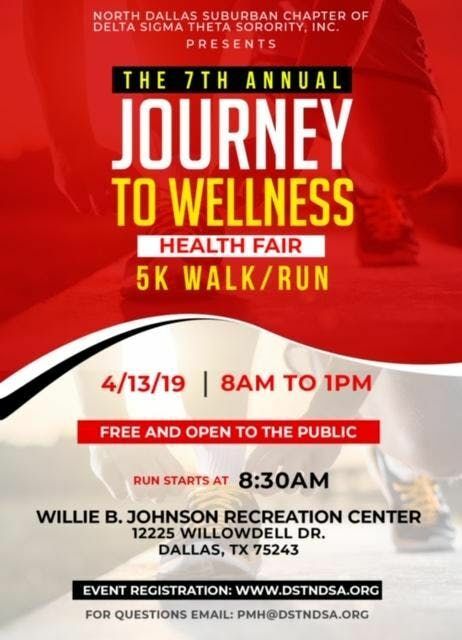 Partnering with the City of Dallas- Willie B Johnson Recreation Center, this informative health fair will allow health organizations to provide tips on easy and inexpensive ways to achieve healthy eating habits, and offer practical ways to keep families physically active. We have an action packed morning planned and look forward to beginning a "Journey to Wellness" with you and your family. For sponsorship/vendor opportunities or general questions, please contact cG1oIHwgZHN0bmRzYSAhIG9yZw==. You may also visit our website at www.dstndsa.org.